Beginning after World War I, Houston was transformed from a black-and-white frontier town into one of the most ethnically and racially diverse urban areas in the United States. Houston Bound draws on social and cultural history to show how, despite Anglo attempts to fix racial categories through Jim Crow laws, converging migrations—particularly those of Mexicans and Creoles—complicated ideas of blackness and whiteness and introduced different understandings about race. 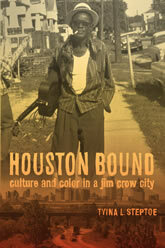 This migration history also uses music and sound to examine these racial complexities, tracing the emergence of Houston’s blues and jazz scenes in the 1920s as well as the hybrid forms of these genres that arose when migrants forged shared social space and carved out new communities and politics. This interdisciplinary book provides both an innovative historiography about migration and immigration in the twentieth century and a critical examination of a city located in the former Confederacy.